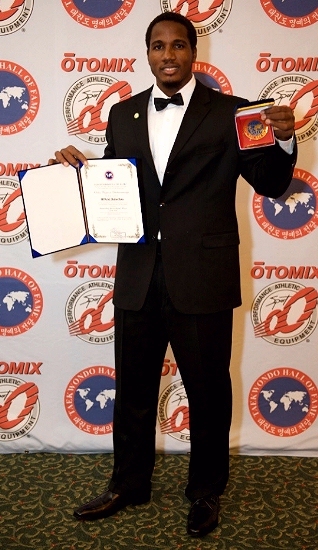 Less than a year after Chika Chukwumerije won a bronze medal in the taekwondo event of the 2008 Beijing Olympic Games, the 25-year-old Mechanical Engineering graduate was yesterday in New Jersey, United States of America inducted into the World's Taekwondo Hall of Fame. This is another feather to the hat of Chukwumerije, whose road to success began when he won the Algiers 2007 All Africa Games gold medal. Shortly before he left for the induction, the Olympian told OLALEKAN OKUSAN, who has been following his progress in the sport, that the award has given him more responsibility to Nigeria. HIS humility laced with patriotism has made him a toast of many Nigerians. This became more evident after his bronze medal outing at the 2008 Beijing Olympic Games. Though Chika Chukwumerije is just 25 years old, some of his elders in the sport and his contemporaries now look up to him as a role model. But the Mechanical Engineering graduate has never been carried away by all these achievements in such a short period of time. Yesterday at the Marriot Hotel in New Jersey, United States, Chukwumerije was among the inductees from all over the world inducted into the World Taekwondo Hall of Fame. The Taekwondo Hall of Fame is an international organization of technical advisors, who are members of the World Taekwondo Federation (WTF), International Taekwon-Do Federation (ITF), World TaeKwon-Do Alliance (WTA), and other major Taekwondo entities. The technical advisors are responsible for identifying, recognizing and honouring persons and groups who have significantly contributed to the development, growth, and advancement of taekwondo as a martial art and a global sport. "This year, in addition to honouring those individuals who are generally considered to be pioneers, we will also recognise and induct several outstanding world and Olympic athletes. As a result, it is not merely requested, but essential that you attend the upcoming official ceremony being held in the United States to recognise and officially receive your designation." Although, he is elated by the recognition from the world body, Chukwumerije believes the award has given him more responsibility to Nigeria in particular, and humanity in general. "As I am going to receive this award, I also want to give thanks to God because God guided me throughout my exploits. I trusted in God, planned and I got the support of people around me. When I did not have the support, I just moved on, so when I was nominated, I looked back and the whole history just occurred in flashes in my mind and I want to thank God for everything. "Also, it makes me realise that responsibility has been entrusted upon me. Before it was a choice to work hard because nobody was watching or cared as I could choose to work hard or play. But it is no longer a choice, but it is a responsibility. I have to work hard because people now expect a lot from me. "There is no pressure on me but the upcoming athletes must be motivated and this will make me work hard to be on top. I am grateful to the organisers for recognising me with the award and I pray that I will continue to make Nigeria proud as long as I am capable. "The award is good for Nigeria, especially West Africa, because the current world champion, Daba Modibo Keita, is from Mali. He is also to be inducted as the "Outstanding Male African World Player". I could remember that at the regional qualifiers for the Beijing 2008 Olympics in Tripoli, Libya, Africa had 16 slots and West Africa won nine of the slots. "With this, I think we are becoming a regional powerhouse, which is very good. But we must not stop there. For me, this is just an award, which recognises how far we have gone and we should go further. We should build on this to ensure our athletics continue to do well at major championships," a sober Chukwumerije said. Although Chukwumerije is thrilled by the recognition, he spared a thought for his teammate at the Beijing Games, Issa Adamu, who made it to the quarterfinal stage, but has not been recognised despite his feat in China. "I could still recollect that in my first outing at the 2004 Athens Olympics, I was edged out in the first round. But Adamu, who made his debut at Beijing, was able to make it to the quarterfinal stage. Athletes that have represented this country at any major championship should be honoured regardless of their performance because this will always motivate them to do well at subsequent events," he said. Chukwumerije would remain grateful to a lot of people, especially his family members for their unflinching support in his quest to make Nigeria proud. "This award makes me look back at where I started from and to be grateful to numerous people who have supported me, most especially my family members who played significant role in my success so far. up gradually. "All the love and support I got throughout these my efforts and when I got the nomination, I think it is only fair for me to share this happiness with all these people. Also to all Nigerians that have been supportive even though taekwondo is not like football, but they recognised that I have a passion and they supported me." Reacting to the nomination, Chairman, Ogun State Taekwondo Association, George Ashiru, said this goes to show that Chukwumerije's achievement was recognised globally; and this puts Nigeria in the league of great countries in the game. Ashiru, who was manager of the taekwondo team to 2008 Beijing Olympics, described the award as the highest recognition in taekwondo worldwide, which is being staged to honour past and present Olympians in the sport. "This is a good thing for Nigeria because this is the first time an African will be nominated into the hall of fame. As Chukwumerije is being named the most outstanding African Male Olympic Player, Mali's Daba Modibo Keita is also nominated as the outstanding male African World Player, being the current world champion. With this, I think Nigeria is now being given the respect at the world level in the sport," Ashiru said. To be part of the event in U.S., the NSC sent a four-man delegation. The Taekwondo Hall of Fame headquarters is located in New Jersey, U.S. with technical advisory staff located in Korea, Canada, Mexico, Puerto Rico, Afghanistan, Russia, Ireland and India.